Jack Chrysler. Jack was the son of Walter, the founder of the Chrysler automobiles. JACK CHRYSLER. 1945, New York. A 20 year, $5,000 bond for the State of New York bearing 4.25% interest issued to and signed by "Jack F. Chrysler" on a separate receipt. Green on white paper with an engraved "Great Seal of the State of New York". 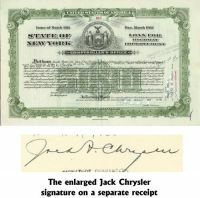 Stamp and punch cancelled though not affecting Chrysler's signature. It is in very fine condition.